If you have installed a new operating system like Windows Vista or Windows 7 on your existing operating system, not upgraded but make a clean install then the Vista or Windows 7 installation wizard takes a back up your previous Windows files. This back up strategy is useful for many times because you might find files, configuration or data files you thought that you lost during the Windows 7 installation or Windows Vista installation. You can copy and paste those files and use in your new system from Vista windows.old folder or Windows 7 windows.old folder. But if your system is suffering from lack of disk space, then you will search for methods to delete and remove unnecessary files covering space on your hard disk. One huge size of data that you may not require is the Vista Windows.old folder or the Windows 7 Windows.old folder and the contents of the Windows.old folder. Of course if you are sure you will not require them later. Windows 7 and Vista has built in tools for windows.old removal. Disk Cleanup can be used for windows.old delete task. Click on the Start button on the task bar for our task to windows.old removal. Follow the "All Programs - Accessories - System Tools" path on the Start menu. 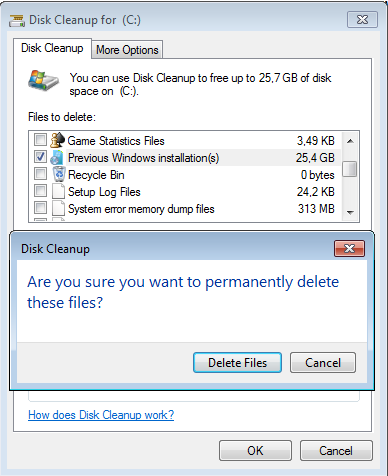 Click and select "Disk Cleanup". 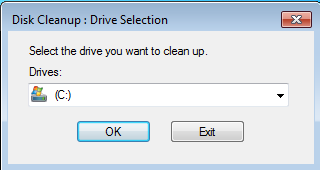 When the Disk Cleanup Options dialog screen is displayed select Files from all users on this computer option. Select the hard disk Drive where the Windows.old folder resides. 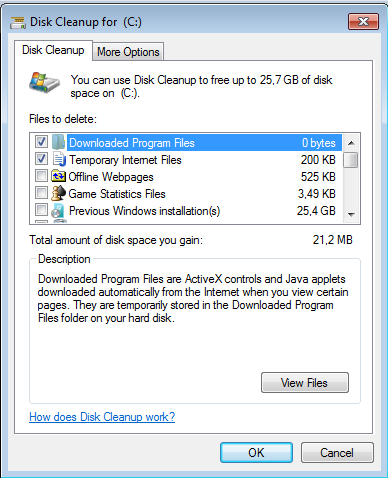 The Disk Cleanup utility will scan the driver for not used and unnecessary files. When the scan is completed check the "Previous Windows installations". When the wizard requests your confirm to delete the Windows.old folder and its content files, select Delete. I hope in this Windows 7 guide, I could give you an answer to a very common question : "How to delete Windows.old in Windows 7 ?" If you follow this simple step by step procedure, you can delete Windows.old folder in your new Windows 7 computer. Of course you should be sure that there is nothing valuable in Windows.old folder for you in later use.